This week’s Weekly Photo Challenge asks readers to post a photo of something ‘foreign’ to them. As most of you know, I live in South Korea as an English teacher, and have been for the last eight months. Seriously, everything is foreign to me. I’m constantly caught of guard by little things, and this reminds me even more that I’m an alien in a strange land. I’ve gotten pretty used to the food…but sometimes a certain side dish can throw me of guard. It’s quite normal to get a side dish of pickled radishes, seaweed, kimchi, rice, cabbage salad, and some sort of grass salad with red paste on it. 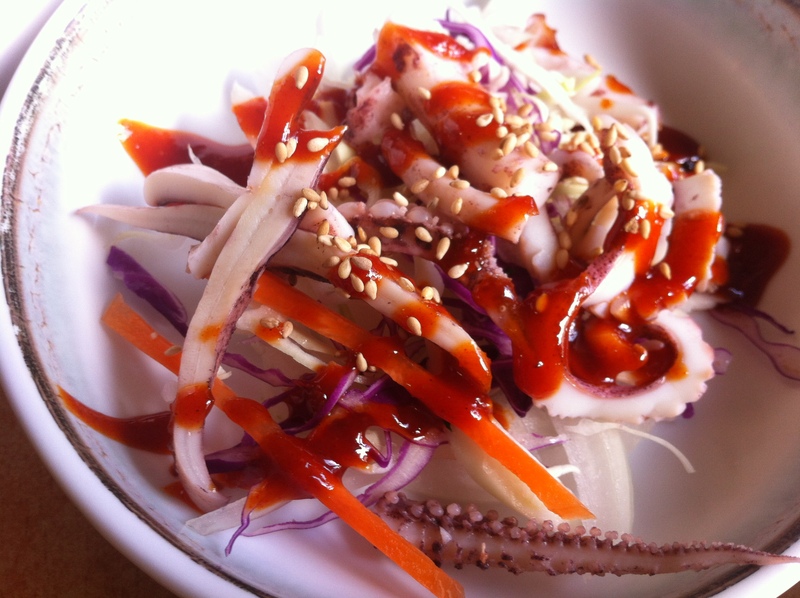 What I wasn’t expecting was, when we went to a BBQ restaurant, to get a side dish of chilled octopus tentacles covered with red paste and served on a bed of cabbage. Thanks for the photo opportunity, but I’m not that adventurous.